This all rubber toe strap holds the rear foot firmly in place, is comfortable and is used by virtually every trick skier on the planet. Mounted to a strong 6061 aluminum plate the PTP has slotted holes allowing the plate to be adjusted for the absolute perfect position. 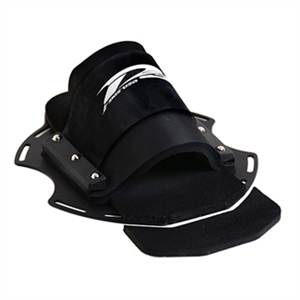 The plate gives the trick ski additional protection from heel dents. The PTP is not recommended for previous model tricks with the SRP (screw retention plate).